Suzuki has launched a new Modern Classics scheme, following on the from the success of its Vintage Parts programme. With a huge number of parts still available for older and classic Suzukis, the Vintage Parts programme has proven immensely popular since its launch, with 140,000 parts being sold last year. Nearly 1,000 parts are still available for the iconic RGV250, which the programme launched with at Motorcycle Live 2013, while 1,200 are available for the GT750 and 1,400 for the GSX-R750F/H. 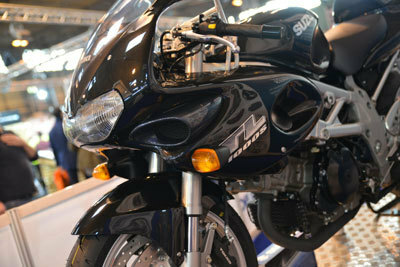 To further demonstrate the number of parts still available for older machines, Suzuki GB is currently restoring a project GSX-R1100L, with 1,500 parts still available for the revered sportsbike, and recently assembled a brand new TL1000S out of genuine parts at Motorcycle Live last year, leading to the launch of the new Modern Classics scheme. Launching with the GSX-R1100L, the TL1000 is set to be added to the programme next month, followed by other popular models from the 1990s, including bikes such as the Bandit 600 and Bandit 1200, all live on the website by May this year. Tim Davies, Suzuki GB's Aftersales Marketing Co-ordinator, said, "Our Vintage Parts programme has been hugely popular since its launch, and we're delighted to now add the new Modern Classics section, focusing solely on bikes from the 1990s. There are a number of bikes from the '90s that still hold big appeal for customers, and there are a lot of owners out there restoring or maintaining bikes from that period. The Modern Classics area of the Vintage Parts programme makes that experience even easier." As with the Vintage Parts programme, the Modern Classics section features full parts lists and service manuals available for download, as well as brochures and other original sales material. For more information on the Modern Classics or Vintage Parts programme, visit suzuki-gb.co.uk/classics.